A key difference between living in a temperate and tropical country is well, the sun. You will realize that with the former, once the sun is out, everyone is out as well. Yesterday was a fine example. After a week of cloud and rain, there was finally much desired sunshine. We went out for an impromptu ride with no research of routes. Like the old Singaporean saying, "just whack lah". It was no surprise that we bumped into many fellow cyclists along our route, and very friendly ones we must add. A subtle nod, a wave or a "how are you" greeting from every cyclist we crossed paths with. 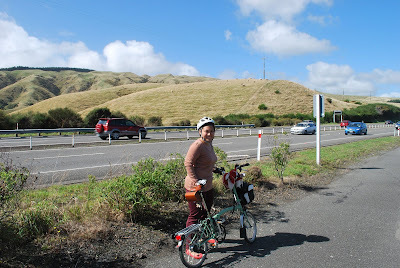 Our unplanned route saw us take the bike path from Plimmerton to Pukerua bay. The path runs alongside the state highway and the distance is about 7km. Not very far on a bike but considering that probably 6.5km of the journey was upslope, it was one heck of a ride. The strong headwind certainly did not make it any easier. 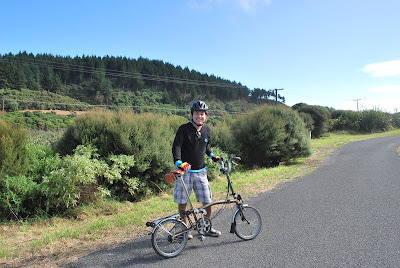 You probably can't tell from the pictures, but trust me, Plimmerton to Pukerua bay is a constantly inclining terrain! It's not always about how fast you go or the destination you reach. It's the journey that counts and the scenic surroundings did make the slope climbing a little more enjoyable. Sheep and New Zealand are almost synonymous. Here is Gwyn with some sheep. Can you spot them? We got to Pukerua Bay only to realize that Fisherman's Table, the restaurant we wanted to have lunch at, was actually not at Pukerua Bay but the next town, Paekakariki. What a blooper. 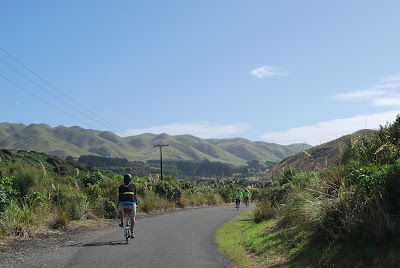 Paekakariki was another 7km away. 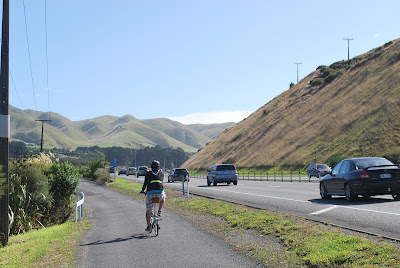 We were famished and not sure if we could do another 7km of continuous climbing, so we decided to turn around and head back to Plimmerton. And boy, does fortunes turn. We rode back in less than half the time we took to get there because basically, we were rolling most of the time. Again, though for different reasons, it was one heck of ride. Very quickly, we arrived back in Plimmerton. 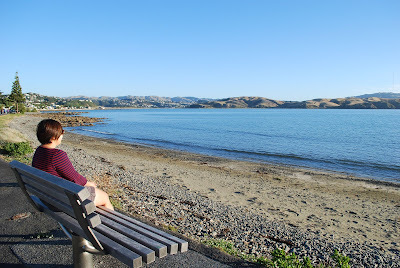 We first got to Plimmerton a month ago. Admittedly, we were initially less enthusiastic about the suburb. There are hardly any shops and the nearest supermarket and ATM are actually in the next suburb. 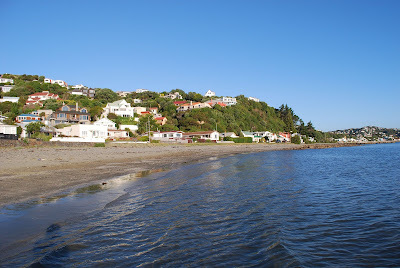 However, the place really grows on you and now, we are converts and absolutely adore Plimmerton. 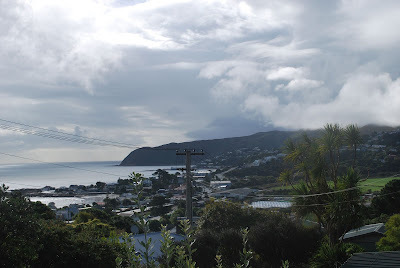 Here is a view of Plimmerton from atop and afar. Plimmerton is very much a seaside town. It's not the biggest of suburbs and most of the houses are sea facing. We love the beach. Nothing more relaxing than chilling by the beach on a beautiful summer afternoon. 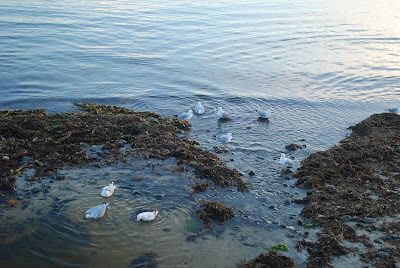 Resident seagulls along the beach. Can you spot the showering seagulls? 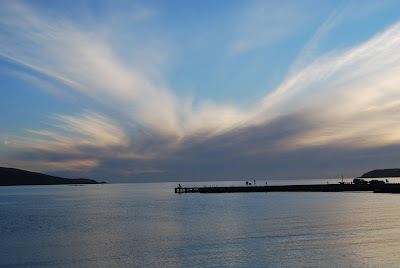 Witnessing sunset at the Plimmerton Boating club along Karehana Bay can be a wonderful experience. The scenery is so beautiful that you don't really have to be a good photographer to take good shots. Virtually any click strikes gold. 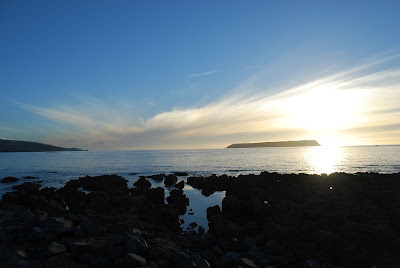 Here is another of our favourite shots from the Plimmerton Sunset, with Mana island in the background.